As we near the end of the semester, so too ends college football season. 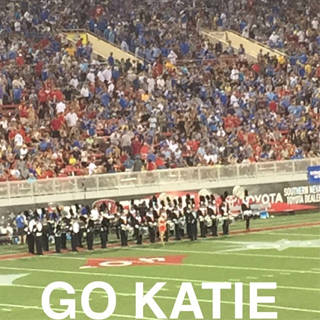 Marching band has been my family since moving to Las Vegas in 2015 and this weekend was our last game of the season, so I thought it was fitting to dedicate this post to the folks who have supported me since my first day at UNLV. I am thankful to have a great community of friends who cheer for me on and off the field. Marching band has been my way of getting involved at UNLV and I am so appreciative for this network of people who keep me going...even when I have two term papers and doctoral applications due in the same week. If there is one thing I can recommend/stress for prospective Master’s students, it would be to know thyself. I encourage you to take the time to reflect on your mission and goals, challenging yourself to go beyond your comfort zone. Moving to a new place not knowing anyone is a challenge. You’re nervous, perhaps excited and anxious to get settled in the community. My advice is to be zen and believe in yourself. Over the past two years I have talked to numerous prospective Master’s students about applying to (higher education) programs. As a peer, I am excited and grateful folks see me as a guide. As a friend, I am glad to have the chance to push people’s boundaries and ask why they are applying to their particular programs and/or schools. Typically these conversations come down to the question, “do you feel you will be challenged and supported in this environment?” Finding your “fit” program is difficult, but a worthwhile process. You want to find a place that will push you outside of your comfort zone to achieve more, while supporting you and your current efforts. Leaving your home state or region was what I needed to explore and be challenged, for others this challenge could come from working in a cohort program. Everyone’s challenge is different. To find this “fit” you must be honest with yourself, identify your goals, and be vocal about your concerns.